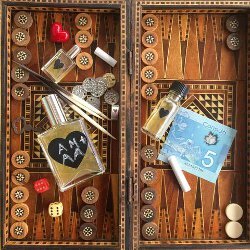 Indie natural perfumer Ayala Moriel has launched <3, a new limited edition floriental fragrance. ...We walked from the top of the hill to the sea and savoured the salted air. We buried our faces in the white blooming foliage of clematis armandii, covering us in a shower of meteorites and drowning our nostrils in their dreamy orange blossom scent. The new perfume is a blank slate in the shape of a black heart upon which you write and re-write your lover's past, present and future. The notes feature cardamom, peppermint, clematis accord, incense and musk. Ayala Moriel <3 is available in 4 or 15 ml Eau de Parfum or 5 ml Perfume Oil ($62 - $156); samples are also available. That 4 mL mini is so cute. Truth be told, I was more attracted to the backgammon board. My dad was an avid backgammon player and he taught us kids and the grandkids how to play so we can play with him. One of his happiest moments was discovering fellow backgammon ethusuiasts at Wegmans! Yes! I was tempted to go search for inlaid backgammon boards on ebay, but I resisted the urge. It’s a great board, and I like the way she used it in the image. When I saw the bottle with the black heart label, I thought it was CdG Play. It is like Play. Like the idea of the chalkboard label though.